Behold the power of the dark side with this Star Wars The Clone Wars Print! Brilliant Star Wars artwork, matted with title tag. Features Count Dooku, Asajj Ventress, General Grievous, and more. The Shadow of the Sith Giclée is limited to just 250 pieces worldwide! Behold the power of the dark side with this Star Wars The Clone Wars Print! The brilliant Shadow of the Sith Giclée is printed on paper and comes matted with a title tag. 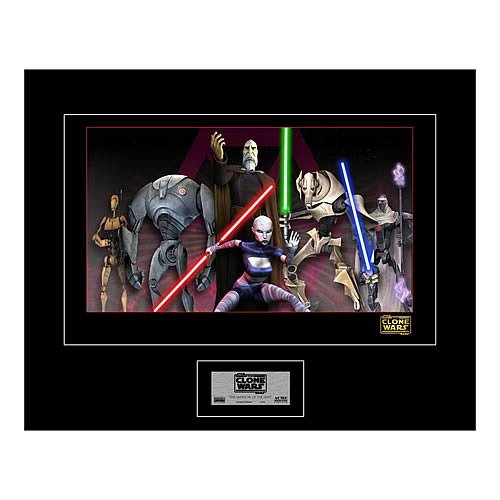 It measures 16-inches tall x 20-inches wide and features a Battle Droid, Super Battle Droid, Count Dooku, Asajj Ventress, General Grievous, and MagnaGuard. The Star Wars The Clone Wars Shadow of the Sith Giclée Print is limited to just 250 hand-numbered pieces worldwide, so order yours now!